I am always inspired and in awe of the fantastic projects posted to our jewelry boards. Let's take a look at three of the most awesome projects posted by our CraftSTARS so far this year. After seeing similar items online, gozer decided to try her hand at creating her own Crystal Necklaces. These tiny terrarium-like pendants are filled with moss and beautiful miniature crystals in shades of pink, purple, and green. I'm always astounded by the intricate and delicate work of appledainty. 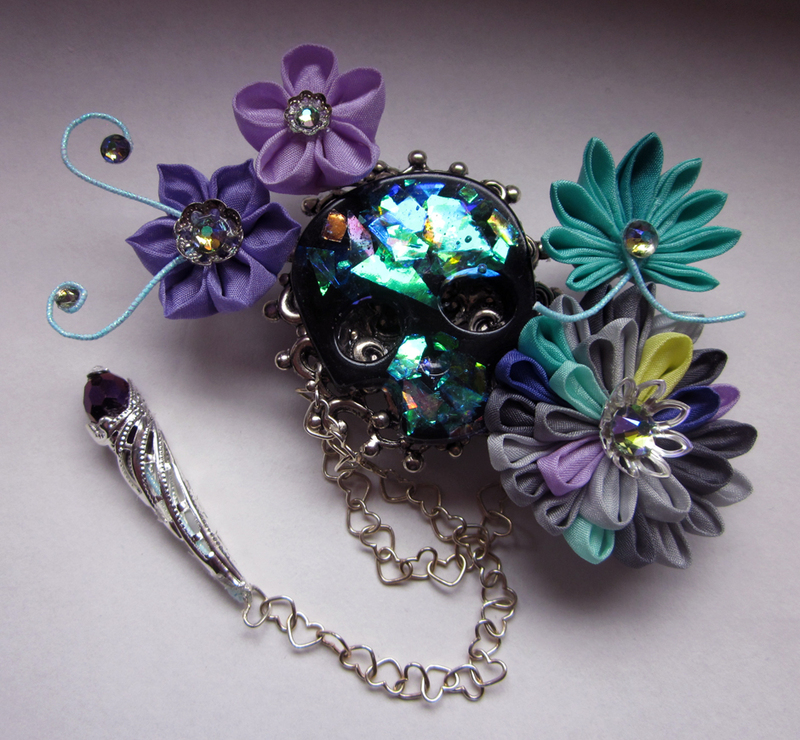 And her new Crystal Skull Brooch might just be my favorite creation of hers yet. The iridescent crystal skull, surrounded by lovely fabric flowers in shades of purple and turquoise just makes me smile each time I see it. And then there's TheMistressT, who pops up all over Craftster with her fantastic upcycling & stash-busting projects. This piece takes both those skills, and spins them in a new direction, by creating a Medal Awarded for Pibbling Above & Beyond the Call of Duty for her darling dog, Delia, out of an unused pendant and some stash ribbon. Delia is sure to start a trend for stylish & valorous pups everywhere! Those are all such wonderful projects to feature. Oh my goodness! I am so honored to be included with the other two amazing projects!!! Everyone is so talented here. Three beautiful projects to feature! Love them all!! !